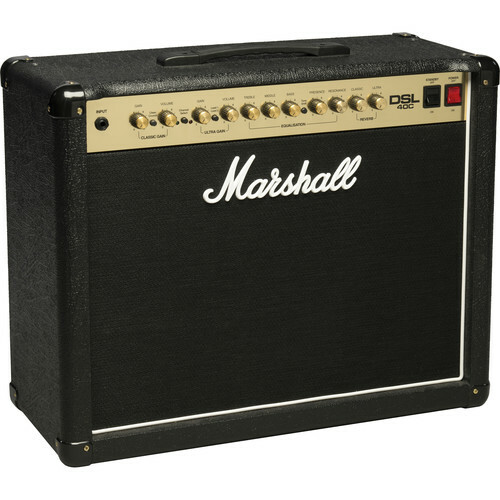 The DSL40C from Marshall Amplification is a 6-valve combo amplifier for electric guitar, featuring a single 12" Celestion Seventy 80 speaker, two channels with separate volume and gain controls, a comprehensive equalization section, and channel-independent digital spring reverb. 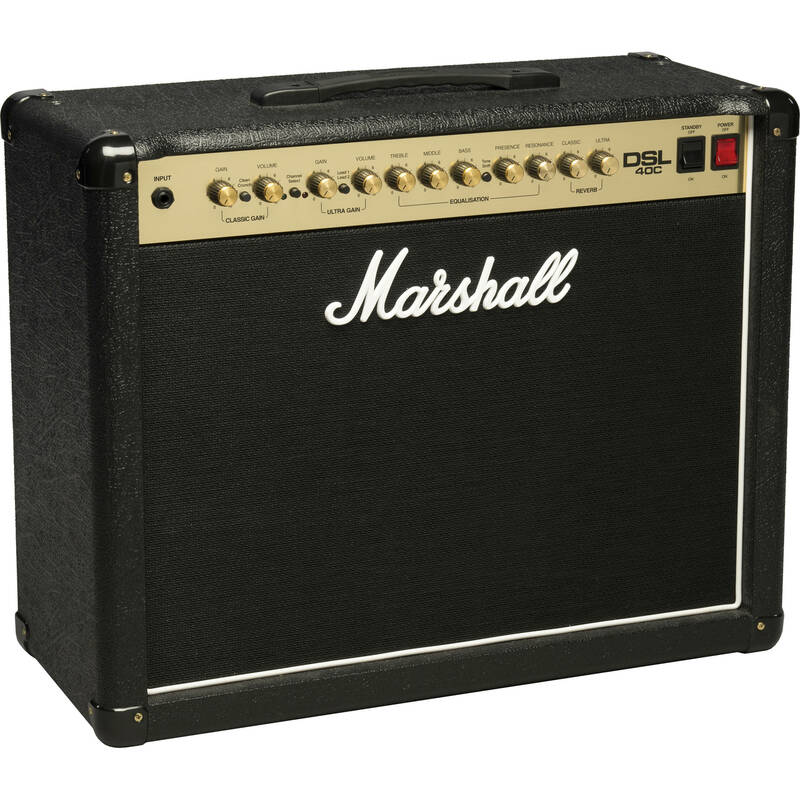 The Dual Super Lead (DSL) offers two channels, Classic Gain and Ultra Gain, each with dual mode settings to provide a wide pallette of classic Marshall tones. Classic Gain takes you from a 1959-style clean to the snarl of the JCM800 2203 via the Clean/Crunch mode button, while Ultra Gain offers a hot-rodded 2203 vibe to an even higher gain response with additional mid-boost via the Lead1/Lead2 mode switch. Both channels share a passive three-band EQ with controls for bass, mid, and treble. The Tone-Shift button provides a mid-scoop that is synonymous with modern metal, especially when combined with higher gain settings. The amp's power section features a control for Resonance, which adds a variable bass boost without adding mud, while the Presence control adds high-end sparkle. Additional features include a Pentode/Triode switch (which halves the power from 40W to 20W), a digital spring reverb with separate controls for each channel, and an FX loop with serial send and return jacks for incorporating effects processors and pedals. The DSL40C ships with a power cord and a two-button footswitch for Classic Gain/Ultra Gain channel selection and reverb on/off. Speaker Inputs 1 x 1/4"
Speaker Through/Output 3 x 1/4"
Box Dimensions (LxWxH) 29.0 x 24.0 x 15.0"